8 year/s ago 1761 Visit WebsitePhilosophyBroken link? Discover and learn about mysteries from the past and how they relate to current society. Content is entirely based on factual and tangible evidence though there is a section for strong spirituality related mysteries. Access is completely free including a new forum section. 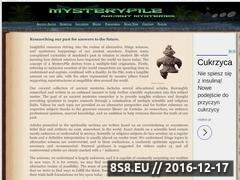 Sorry, BrowseInter.net Website Directory does not contain yet any other websites related to ancient, mysteries or paranormal!